Really cool tool, yorkeiser... I'm looking forward to see it released! Thanks vilvoh, you're very kind. The tool was made for personal purposes: I use it to analyze the network and find its weakness, so I honestly never planned a "public" release. Playing Simutrans I always felt the need of a similar built-in tool, so I wrote an external one - it reads the .sve file and builds the graph, so it doesn't need any official simutrans file. But that's obviously my simple point of view and maybe other players absolutely don't care about this functionality. However, if the community shows some interest about this and the developers agree, I can also think about releasing a public version, extending the functionalities (actually really limited, according to my needs). There is already a function to show a selected line on minimap. Could it be possible to patch the program to display them all at once? Yes, you're right Fabio, and I think it would be very easier to write an internal class/function/plugin that already has access to the variables it must use, rather than using an external tool that relies on the binary format of the .sve file, that besides is quite cryptic and can change in the future. However, the functionality would have to draw on a white (or however monochromatic) field, otherwise i think it would result unreadable. I don't know if this is actually possible; it seems to me that at the moment the various map visualizations are always drawn above the classic map background (greens for terrain, blue for sea and greys for cities/roads), isn't it ? wouldn't it be an alternative to define an interface to provide relevant data of a game to external programs? They could be coded indipendently, so it's less workload for you to integrate them. Also this would allow to leave the tight boundaries of simutrans rendering. One major additional advantage could be detailed statistics or analysis of network games on websites. This will also still the desire of some of the powergaming users to get more economic data and analysis, without bloating the gui. Perhaps the most straighforward and flexible way would dumping relevant data to stdout, perhaps xml formated. Can easily be piped into whatever we want. I apologize for bumping, but I would like to politely ask yorkeiser if he still has the java file for creating a network-map. I would find this useful for my current game. Thank you. Hi statto, I apologize for answering so late, but I've been away for work. The tool I was writing was far from being complete: the major problems were to find some logic inside the sve files, that don't have a fixed structure. This means that sometimes it could draw the map with precision, other times the drawing was incomplete or lacky. It was written and tested for pak128; I tested it successfully also on pak.britain but I had to make some changes on the code because there were some different offsets in the .sve file, regard the pak128 .sve. At this time, the tool isn't yet parametric with the pakset. However, if you're still interested, I'll try to see where I put the java code (in the last month I changed my PC and I had to backup the old hard disk, where the tool was stored) and send it to you. Basically, the program reads a non-compressed, XML format saved game (I apologize, but it's not easy to work on the binary format from an external tool) and displays the network structure, allowing zoom functionality and selection of lines to be plotted. 1) Have java installed (Java RE >= 1.5 should work with no problems). If not, to install it go to www.oracle.com and download latest "Java standard edition runtime environment"
On some Simutrans' versions xml saving is buggy, so when you save the game in this format you can have problems to reload the file in simutrans. To avoid your game getting lost, ALWAYS make a backup of your savegame (.sve file) before saving it in xml format. To run the program: download the .zip, extract the .jar inside, open a command prompt and write: "java -jar path+filename.jar" e.g. "java -jar c:/tools/simuMapViewer.jar"
From the program interface, to load a file click "Browse" and search for an XML savegame (.sve), click open, click Load, wait for the program to load it. I love this tool! I can not wait to try it. One question ... is compatible with the pak128 or even with other pak? The only thing is: When lines are mirrored, this is wrongly displayed on the map. But other than that, it is perfect! PS: you can run the .jar-file directly in Windows - no need to use the command prompt. Milko, I tested it on pak128 and pak128.Britain, but it would have to be compatible with every pakset using the same savefile format. omikron, what do you mean by "wrongly displayed"? Have you a screenshot? The only problem I noticed is that if you have double lines with double stations , e.g. it will display a thicker line. That's because the tool reads the coordinates in the list of the line and plots lines between them. I have to see if I can join all lines arriving at one station (even with different coordinates) in a single point; to do this I have to inspect the part of the savegame that saves infos about stations. In simutrans experimental, there is the feature of 'mirror schedule', which means that once the schedule is finished, instead of starting again on the top, the convoy will just follow the schedule in the opposite direction. In experimental, you set the schedule A - B - C - D - E and then select mirrored, giving you the same result. In your route-map tool, the programme obviously interprets the latter schedule as a 'normal' schedule, painting a line from E to A, which shouldn't be there. If you want to, you could probably add an if-line checking whether the 'mirror schedule' box is selected and then not painting this last line. However, I need help from somebody else to help you find out how tof ind this information in the sve. omikron, many thanks for this info. I never use experimental versions, so I didn't know of this feature. In standard versions, the line-mirroring button simply adds new stops (in reverse order) to the schedule, so I manage direct and mirrored lines in the same way. I would say better result. Because that line is much more easily upgradeable if you add/delete stations than the approach of Standard. Here is a screen shoot of a semi-recent game of my using your network diagram tool. However, in the next version I'm trying to write an algorithm to automatically build a simplified diagram of the network, similar to the ones you can see at metro entrances and so on. It's quite difficult to write something similar, mainly due to the fact that every savegame has its own structure and dimension, so it's not really easy to define a general model for the graph. you can find a first implementation of such an algorithm. Til now it's very far from being reliable in every map configuration, however with some parameters/map configuration it succeeds in displaying the map. To access the new functionality, click on the "Railway network" button and adjust the slider on the left, that basically manages amalgamations between the nodes of the graph: greater numbers mean more amalgamation between graph nodes. The "good" value for that parameter is totally relative to map morphology, so I prefer let the user adjust it, rather than impose it from the program. One note: the graph only shows train lines, that are supposed to be longer ones; in the future, I can also extend it for other lines, with really little effort. When in graph visualization, you can always switch to map view by pressing the same button. As when in general map, you can hide lines by using "Toggle lines" button or zoom the map. In addiction, I added a new button, "Shuffle colors", to randomly change the color of the lines, that sometimes are too similar. Any testing and feedback is well appreciated! This is very interesting. I wonder whether there is a way that this could be installed on the server listing server so that online games could be queried every now and then and a network diagram generated from them in this way? I imagine that the server savegame would have to be accessible by FTP or somesuch for this to work, but that would be no great difficulty in principle for the server, I imagine. Topic moved to "Tools" board. Nettool could be easily enough extended to be able to transfer the savegame (there's already a command to ask the server to save the game). A server admin could set up a script to periodically save the game, copy the savegame and then perform whatever analysis they like on it. I would like that. At time you need plain XLM. At last i think about a future request to change the save format in the save dialog and not in the settings. I'm very happy you find this useful. Airlines would have to be already shown on the general map (not in the rail schema), if you don't see them plotted please provide me the savegame, so I can try to investigate this. The railway diagram shows only rail lines by purpose: I think it would be very confusing to add too many lines on that diagram. In addiction, bus lines are supposed to be shorter than rail ones, and diagram representation is better on long lines. 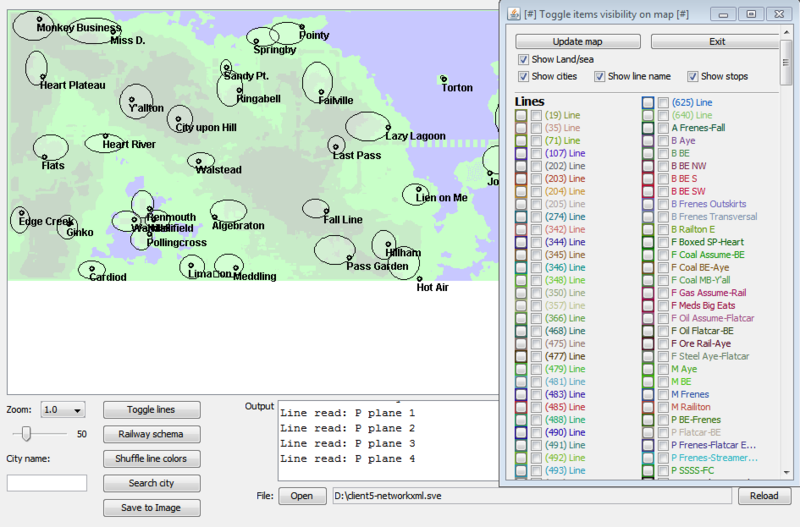 However, when I have some spare time I'll add also functionality for showing/hiding air/bus lines also on the diagram. Sorry i don't blam anyone i assure you but the problem is widespread simutrans where I can not open savegame at all but I will uninstall and reinstall the game. Here is my savegame, it would be nice if you take a look at it. Sorry for the time i take to put it online but simutrans didn't wanted to load it because of thr size. Sorry again if I could seem angry but i'm not, you're a very helpful community and I would not dare to criticize anyone. Hi Vonjo, I don't exactly draw an image, instead I override the paint() method of the panel. Thus, the output is not an Image, but the JPanel itself. However yes, I use methods belonging both to Graphics and Graphics2D to draw on the JPanel. 1. Simutrans can execute this diagram tool locally, and display the exported image file. This is a simple and quick (or temporary) solution to "integrate" it to Simutrans. 2. We can make something, like a web server, which open a savegame, generate an image, and send it back to the user. The user can open it from any web browser to check the current state of the network game. It shouldn't be so hard, just may take some time. 3. SVE viewer with this tool. No need to launch Simutrans. EDIT: This tool is finally released. Scroll down for download. Gives a new Relase from those Programm? Hi greenling, we'll provide a new version as soon as Vonjo sends me his new code, so I can re-align source code with small changes I did after I sent him the code (some bug-fixes). There are also new functionalities about city-search and line-color manual picking. Many thanks to Vonjo for helping on the tool. Obviously, I'm still hoping someone can translate this into Simutrans' architecture.